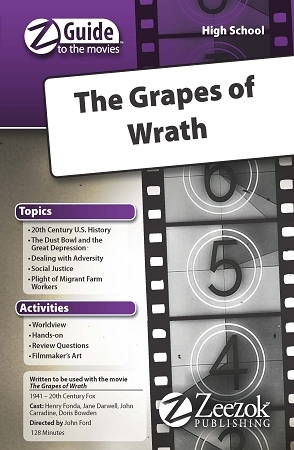 Zeezok Publishing's Z-Guide to The Grapes of Wrath is a great way to incorporate media into your study of the Great Depression. Recently-paroled Tom Joad returns to his home only to discover that the Dust Bowl and the Shawnee Land Company forced his sharecropping family off their land. Believing a handbill promising good-paying jobs further west the Joads pack their belongings in a truck for the journey to California. Can the family survive in spite of illness prejudice and the Great Depression? This Z-Guide contains a topic overview a movie synopsis and ten learning activities based on this classic film. Learn more about the Dust Bowl and Route 66. Discuss how government relief agencies would have made a difference in the life of the Joad family and examine Casys theology. Develop a plan for moving your family Okie style or produce a public service announcement notifying the Okies about real-life conditions in California. Evaluate your own beliefs with the worldview activity probe the directors mind with The Filmmakers Art activity and get the entire family involved with the For Family Discussion section at the end of the guide. Choose those activities which best fit your students course objectives areas of interest or time schedule. This Z-Guide is based on the movie The Grapes of Wrath (1940). You can view a trailer for the movie below.